IT is a cliché that seems to have been around ever since the invention of the car, whether men are better at parking that women. Well according to Gallus Strobel, the mayor of a small German town, ‘men are, as a rule, better at such tasks’ and he has decided to help the townsfolk by ordering parking bays to be painted with a male or female symbol, depending on their difficulty. For those of you wondering what makes a difficult parking bay, according to Strobel male bays are tighter, positioned deeper within car parks and are close to concrete pillars. On the other hand, bays allocated to women are situated in well-lit areas, near to the car park exits and are much wider. Whether you agree with the mayor’s sentiment or not, the small town of Triberg, which is 100km south of Stuttgart and has a population of around 4,500 people, has already seen a noticeable increase in tourism, as people flock to the town to take on the mayor’s parking challenge. The decision comes following a similar move in China last week which saw a ladies-only parking zone be opened in Tianjin, coming complete with pink decor, neon signs and hazard bumpers in each space. A rather interesting stunt to be honest. How else would a car park in a town no bigger than Hebden Bridge gain international coverage. Maybe we are seeing a new trend? Perhaps someone will start a car park game where you can go around the country scoring yourselves on your parking prowess…then again, let’s hope not! Picture courtesy of Daily Mail. Thanks Richard! A quick and easy way to gain coverage – genius really. Plus where ever you are reading this news story from in the World there will be a debate brewing. 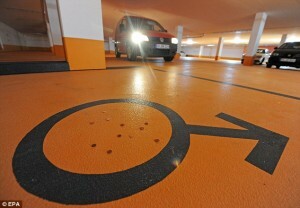 I think the male/female parking competency thing is pretty much universal.